A Wrinkle in Time, Madeline L’Engle – As I closed this one, I knew deeply and for the first time, “I love books.” In its weird way, this book challenged me to begin uncovering layers to a faith that allows itself to both doubt and think. The Bible – (Esp. Matthew 5-7, Galatians, Judges 6) Jesus intrigues me both with his life and his words, especially when He’s talking in contradictions, telling stories, or generally flipping everything on its ear. Reading the Bible Again for the First Time, Marcus Borg – Helped me to re-imagine my faith at a time when I needed re-imagining. The Power of Now: A Guide to Spiritual Enlightenment, Eckhart Tolle – This book helped me to see my faith from a different angle. This book continues to challenge me in my daily life. Falling Upward: A Spirituality for the Two Halves of Life, Richard Rohr is a genius who challenges us to not just be but do faith in a way that is grown-up and childlike at once. The Elegance of the Hedgehog, Muriel Barbery – Gave me words for the fact that I’d been living “out in front of myself” with the vision of the soccer player. That one line comes to mind again and again as a sort of litmus test, keeping me from my frenetic default. This is Water, David Foster Wallace – This isn’t even a book. . . it’s a graduation commencement speech. It challenges me in my daily living in a beautiful way. Click the link, read it and you’ll see. The Manufactured Crisis, David Berliner & Bruce Biddle– Helped me to see layer upon layer of my invisible hegemony. Wounded by School: Recapturing the Joy in Learning andStanding up to Old School Culture, Kristen Olson – Changed the type of teacher I have allowed myself to be. Chasing Hellhounds: What my Students Taught Me, Marv Hoffman – Changed how I look at my students. Crucial Conversations: Tools for Talking when Stakes are High, Kerry Patterson, Joseph Grenny, Ron McMilan, Al Switzler – I am not naturally assertive. This book gave practical strategies that gave me courage in a number of scary/needed conversations and helped me not only survive but also enjoy my dissertation proposal and defense. Bird by Bird: Some Instructions on Writing and Life, Anne Lamott – Find me an English teacher who doesn’t love this book. The Artist’s Way: A Spiritual Path to Higher Creativity, Julia Cameron – Changed how I identify myself, and healed some old hurts. Always We Begin Again: The Benedictine Way of Living, John McQuiston – This little book is on my desk at work. I’ve read it more times than any other book. I put a little tally in the cover each time I “begin again”. Benedict says that through practice we can actually change our nature. I’m working on this, and slowly-slowly-slowly this book is soaking into me. Wild: From Lost to Found on the Pacific Crest Trail, Cheryl Strayed – This book inspired me to be truly courageous (the kind that borders on crazy) for the first time at 29-years-old. 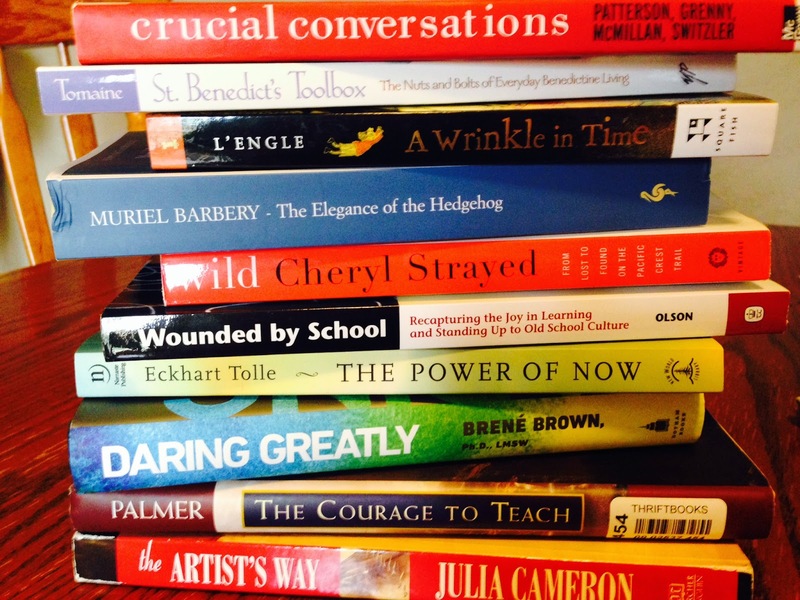 The Courage to Teach: Exploring the Inner Landscape of aTeacher’s Life, Parker Palmer – This is the first book I ever read where I wanted to highlight everything. I felt that I met my first kindred spirit, and it was an amazing grace to sit in the text that seemed to hug me with the words “me too.” It is my favorite. That’s my “short” list of books that have changed my life. As I get wrinkly (and more spunky), I hope the list will grow. I’m thankful in advance for any sort of wisdom left after the words of those who’ve come before have washed over me and over me, leaving me smoother, shinier, more myself, more turned out simply from words on a page. Someone told me once that books are mirrors to help us see who we are and windows to help us see possibility. Cheers to those who take courage to write words that help. Oh…The Manufactured Crisis!! That brings back some memories! !